Crows nest in the old keep of Pitsligo Castle near the village of Rosehearty in Aberdeenshire. Dating from 1424, it’s an impressive and atmospheric place. The Forbes family who built it, staunch Jacobite supporters, lost their lands and titles after the battle of Culloden. The castle was then ravaged by Hanoverian soldiers and fell into ruin. 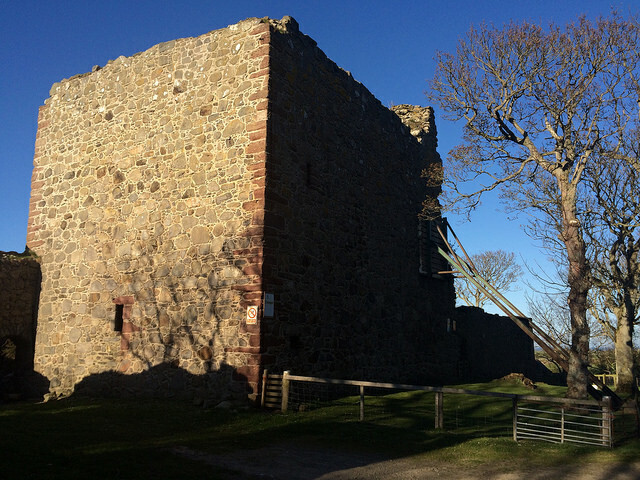 Read more on the Pitsligo Castle Trust website. 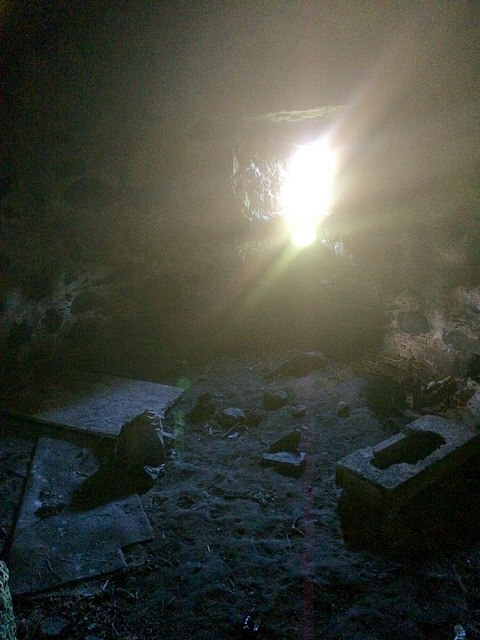 Many of the rooms round the rubble filled courtyard remain intact. The evening sun added bright effects on this visit. Here and there the sky shows through chimneys, windows and decayed stairwells. 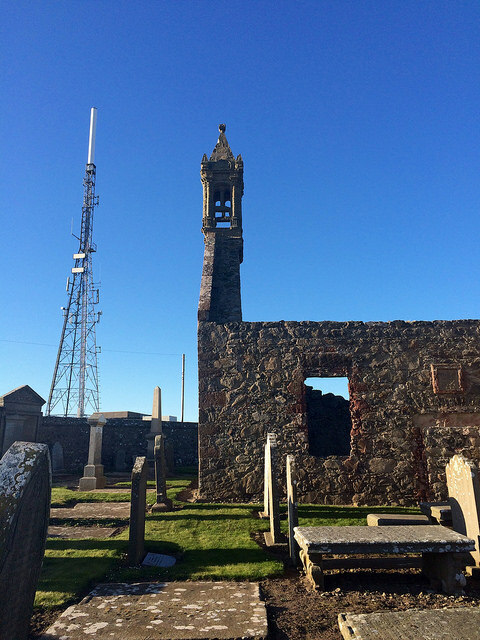 Just up the hill is Peathill Kirk where old and new towers stand side by side (and phone reception is great). Ghosts of Jacobites lurk here too. The two sites make a trip up Peathill most worthwhile; they would been used and inhabited at the same time and offer an evocative glimpse into the past. 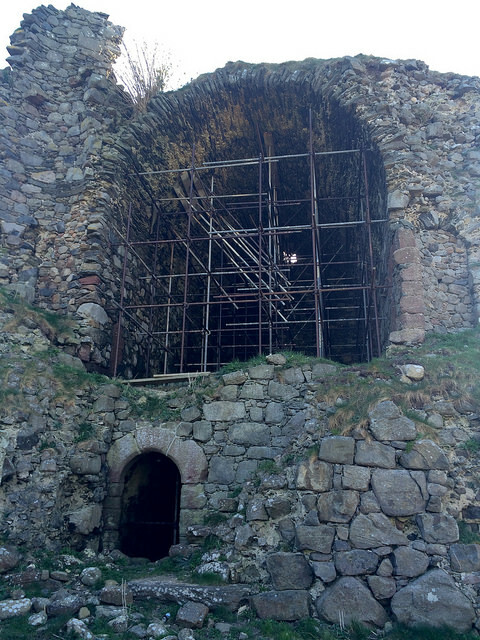 After writing this post I read up on Lord Pitsligo, whose castle this was and who is buried under the place pictured in that last photo and I wrote some more: In Search of Lord Pitsligo’s Cave and then over on The Witch, The Weird and the Wonderful! This entry was posted in dark places, green places and tagged castle, history, Scotland, tower, trees. Bookmark the permalink. This is why I love Scotland. Old. Old. Old. So old and beautiful. Thank you so much for sharing. Such beautiful pictures. Great photos of outside and INSIDE! Braver than me. My curiosity pulls me into those scary dark places! My claustrophobia pulls me out. Well. at least you’ll never be squashed by collasping castle ceilings! Hi Ailish, great photographs, thanks for sharing. I’ve long been a fan of Lord Pitsligo of the ’45, whom I’ve written up in my Jacobite books and here on my blog a few months back. Would it be OK with you for me to link this blog to your pix here? Snowing in our part of north-east Scotland this afternoon at the end of April! Absolutely fine 🙂 You have a fascinating blog! Thanks, Ailish. I’m a novice at blogging, still finding my feet! When I saw the sunny photo, the one casting the arch perimeter’s shadow, immediately I wondered how many others had walked through that space, into or away from the sunlight—gorgeous. I really enjoy your art. Is just amazing what you can see trought a lense. This is the tomb where the famous Jacobite ‘Lord Pitsligo’ is laid to rest.